The last session of the V4 in Europe initiative, gathering the participants from Visegrad countries for the meeting in Warsaw. The aim is to discuss the results of the lessons in high schools in Czech Republic, Hungary, Poland and Slovakia, compare the experience and attitudes of youth. As the final product, the participants will combine their reflections on the most effective methods in the open source lesson scenarios, that will be published online. The EAD and VSPS organize the conference "The Role of EU and NATO in providing peace and security in Europe" as an integral part of the V4 in Europe and Academy of Young Diplomats programs. It will gather 200 AYD students from around 40 countries, as well as 100 students from the Jagiellonian University. The event will focus on increasing understanding among students and young professionals of the importance of these two international organizations for the continuous development of the continent in general and Central Europe in particular. The conference will host a number of key EU and NATO experts as well as representatives of both organizations. The conference will be held in partnership with the Jagiellonian University, NATO, International Visegrad Fund, Konrad Adenauer Stiftung in Poland and Council of Europe. The second workshop session of the V4 in Europe initiative. 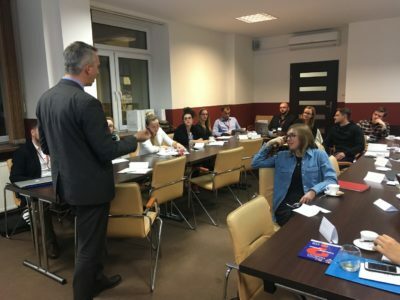 The participants will attend courses preparing them to act as mentors and facilitators during lessons on European integration and the Visegrad Group in high schools. They will attend trainings on public presentations, millennials and working with youth. In addition, some of them will be asked to act as experts and speakers during the Academy of Young Diplomats' conference "The Role of EU and NATO in providing peace and security in Europe", organized at the Jagiellonian University, in cooperation with NATO, Community of Democracies, Konrad Adenauer Stiftung, Council of Europe and the International Visegrad Fund. First workshop session of the V4 in Europe initiative. After attending the World Forum for Democracy, participant from Czech Republic, Hungary, Poland and Slovakia will meet in Warsaw to discuss the most pressing challenges faced by the European Union. They will meet with experts, politicians and diplomats to debate the opportunities of Visegrad cooperation, role of V4 in the broader context of European integration and possible scenarios for the future. Is Populism a Problem ? The 2017 World Forum for Democracy will focus on the role of political parties and media in the context of rising populism. A growing disconnect between citizens and political elites and dramatic changes in the media ecosystem are a challenge for democracy as we know it. New political and media actors and practices are emerging, offering opportunities for direct, unmediated engagement of the public, unbound by ethical or institutional safeguards. How can pluralism, freedom of expression, and fair and evidence-based public debate be safeguarded in these new conditions? How to nourish political culture which embraces a long-term perspective and resists the excesses of populism?